My oh my, what a lot of entries in June and such wonderful creations, myself and the DT have really enjoyed visiting your blogs and looking at all the talent out there. And of course you set us another very difficult task of selecting our winners. Pop back tomorrow when I will be posting our new July challenge and details of the fabulous prize that will be on offer..........some really great stash that has only just hit the craft world. Good morning all your crafters out there. Much as I hate having to do it, I am afraid there is a need to remind people of our challenge rules. They have been on our sidebar since day one, but in your eagerness to win our fabby prizes, some of you are forgetting to read them. I know they are a pain in the rear, but it's only fair to your fellow entrants that you take a moment to read them before adding your entry. Quite understandably, some peeps have been getting rather upset that some of you are not following the rules and with such great prizes on offer we do have a duty to make sure everyone plays it by the book. You can combine your entry into Stampalot Challenge with a maximum of five other challenges - that's six in total. You can enter more than once, but you can only enter one card and each additional entry must be a different type of project- e.g: a l/o, or box or some other craft item you have created. You must include a link in your entry post back to Stampalot Challenge - lots of your links just go to your own blogs or there is non at all. If you don't know how to do it, please mail me, I am always happy to help where I can. Checking out each entry to make sure it complies with the rules takes lots of time, but if you all take just a few moments to check the rules before you post your entry, life will be a lot easier for us all. In future, any entries that we consider do not comply with the rules will be removed from Mr Linky immediately and will not be eligible for the prize on offer or our Top 3 that month. Where possible I will send you a message to explain but this is not guaranteed. This does not mean you are prevented from doing a new entry that does comply with the rules. Good morning all you crafters out there and welcome to a brand new Stampalot Challenge. Yet again you wowed us with all your fabulous work in May, so a huge thank you goes out to each and every one of you for helping us make our new challenge such a success. Before I tell you about this months challenge can I remind everyone that we do have a few rules on the sidebar and especially that you can combine your Stampalot entry with a maximum of five other challenges. Nobody likes rules, but we hate to get to your blogs and find a super piece of work that can't be included because it has been combined with a long list of other challenges. And most of all I so dislike having to be the the baddie to tell peeps that they are not eligible for the prize on offer. 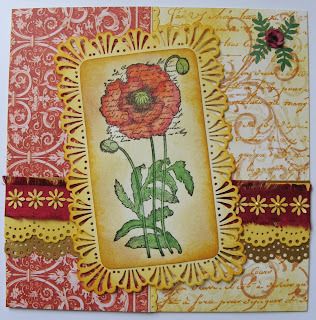 With all the gorgeous punches available now we are sure you will have great fun with this one and we are really looking forward to seeing how you use your punches on your projects, be it borders, flowers, or something completely new. As usual your project can be anything you have created yourself and for any occasions, the only requirement is that we see some punched elements on your work. And of course we have another fabulous prize for this months lucky winner.......these Stampalot guys are pretty darn good you know...... and as the theme is all about punches, what better prize that this amazing array of all things punchy - ** Two Martha Stewart Around the Page sets ** Three of the fabulous EK Success Paper Shaper sets which have not only the punch but matching stamps and ink pads all included ** A fabby Prove Craft tool set........and it's pink ** Plus a whole load of corner, stitchy and other punches. I had a quick add up as I went along and got to £201, so a pretty amazing prize. I think the DT have had their own little competition going on to see who can use the most punched and it's been a bit like stop the difference as they all came up with the artwork for this month. You can click on their names to go to their blogs to see how they created their work.